In collaboration with the Federal Foreign Office, BICC met with experts and partners on 30 January to discuss Disarmament, Demobilisation, and Reintegration (DDR) as well as Security Sector Reform (SSR) efforts in South Sudan. Confronted with the events at the end of 2013 the workshop’s aim was not only to assess past activities but also to identify possible paths forward. Among the participants of the workshop were representatives of the South Sudan DDR Commission (SSDDRC), the United Nations Mission in South Sudan (UNMISS), the United Nations Department of Peacekeeping Operations (DPKO), the World Bank, the Inter-Governmental Authority on Development (IGAD), Adam Smith International, Chatham House, as well as representatives from the German Foreign Office and BICC staff. In a lively exchange of opinions and insights the participants first analysed past DDR and SSR activities in South Sudan between 2005 and 2013. 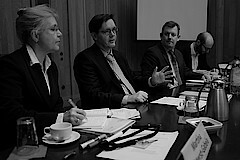 It was made clear that SSR and DDR processes supported by the International Community were insufficient to contain the outbreak of hostilities in December 2013. Potential avenues for future engagement were discussed in the second part. While the participants agreed that DDR and SSR need to play a central role in ongoing peace talks currently taking place in Addis Ababa, they also emphasised the necessity of translating the insights gained over the course of the workshop into concrete actions. A short report covering the main conclusions will be made available within the coming weeks.